AP&A Group invests in research and development and cooperates with strategic industrial, academic partners and institutions or cutting edge technical projects. These are undertaken at a UK, European and International level including partners such as University of Strathclyde, Caledonian Macbrayne, Danaos, Lloyds Register and Jumbo Shipping amongst many others. In addition, we work closely with Newcastle University Alumni Association and industry trade bodies. SEAHORSE – Safety Enhancements in transport by Achieving Human Orientated Resilient Shipping Environment, is a leap forward towards shipping safety achieved through technology transfer from air transport to maritime transport focusing on human factors problems in an innovative, integrated and multidisciplinary manner towards safer and more resilient shipping operations. The SEAHORSE project tackles this challenge by bringing together an experienced, diverse and committed consortium from the air and maritime transport sectors to facilitate the transfer of proven resilience engineering methods. The SEAHORSE concept has the potential to create a significant impact, in making ship operations safer and more resilient. INCASS -Inspection Capabilities for Enhanced Ship Safety – solution for efficient monitoring and ship inspections. The INCASS project is funded by the European Union and brings together a range of experienced and dedicated partners from 7 European Countries. – Introducing Condition Based inspection tools and methodologies, reliability and criticality based maintenance, providing an enhanced Central Database including ship structures and machinery available to maritime authorities (e.g. EMSA, Port State Control), Classification Societies and ship operators and eventually by developing a Decision Support System for ship structures and machinery for continuous monitoring and risk analysis and management of ship operations. 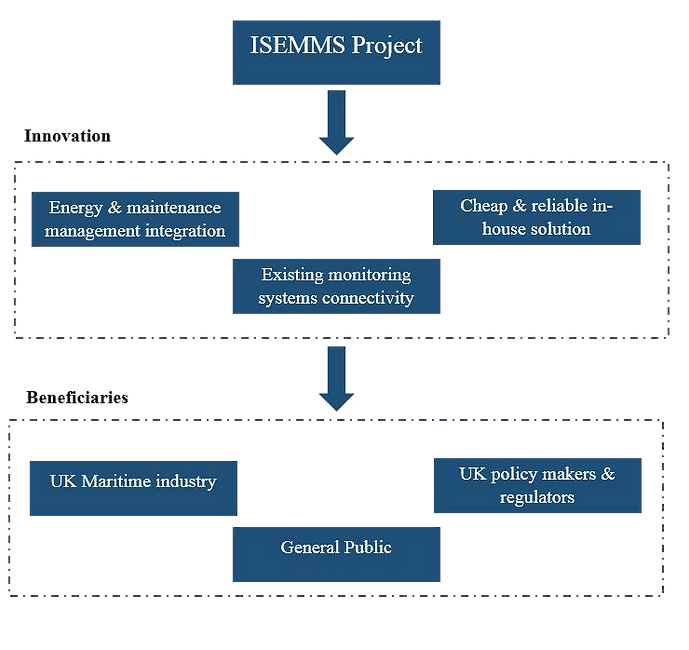 The ISEMMS project aims at the development of an integrated energy and maintenance management system to optimise the energy efficiency and minimise the maintenance cost of ship machinery systems by monitoring of the performance, emissions and plant condition parameters, culminating in proposing the most effective energy and maintenance scheduling. A number of advanced technologies including model based power management and fault diagnosis, condition/performance/emissions parameters monitoring, machinery vibration monitoring, infrared radiation and fluid analysis, multi-criteria optimisation techniques and machinery risk analysis will be combinatory used. Data acquisition will be integrated with the ship control systems and the acquired ‘big’ data will be analysed using statistical and artificial intelligence algorithms and transferred ashore using satellite communications providing decision support and advise for optimal operation/adjustment of the system parameters and the most effective maintenance scheduling. The ISEMMS system development will lead to a significant improvement in the vessels energy efficient operation and the reduction of the operational cost.